Poster! 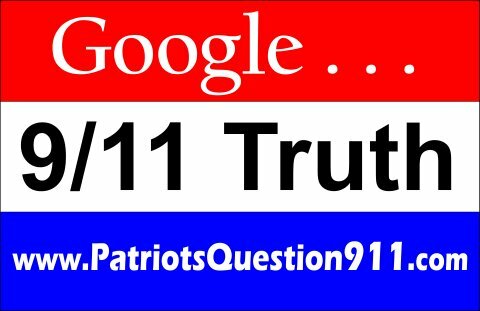 "Google 9/11 Truth www.patriotsquestion911.com"
The file is in the .png format which can be opened with Microsoft Paint. This image is sweet for printing out huge banners as well as small posters (in Paint you can go to Page Setup and select Fit to: to adjust the number of pages it will take up). p.s. I recommend purchasing a hand-held tape roller if you're going to be posting them up--they're only about 10 bucks! I decided to make this poster as I think there is a real shortage of quality 9/11 posters available online. I got the inspiration for this poster from Kevin Barrett's signs--I think the question format is quite powerful. It's in .doc format and is 8.5*11 in size. "When you are inspired by some great purpose, some extraordinary project, all your thoughts break their bonds, your mind transcends limitations, your consciousness expands in every direction, and you find yourself in a new, great, and wonderful world. Dormant forces, faculties, and talents become alive, and you discover yourself to be a greater person by far than you ever dreamed yourself to be." Reach thousands of commuters with 9/11 Truth banners on utility poles.